Two minute microwave mug cake recipe, as the name suggests, is an instant cake recipe that can be prepared in microwave and that too in maximum two minutes time. With such fast and hectic lifestyle, the recipes also should be quick & simple. 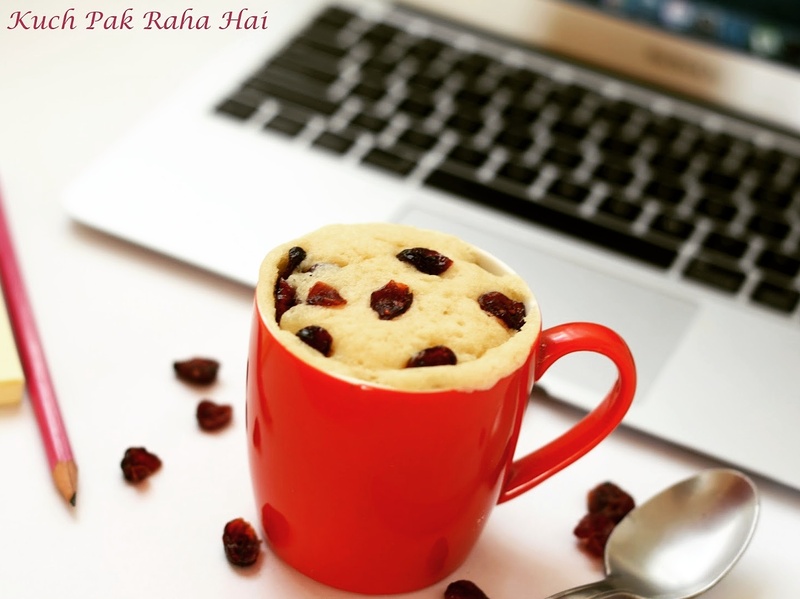 This recipe is perfect for the time when you are craving for something sweet after your dinner or to munch after you have returned from a long tiring day at office. 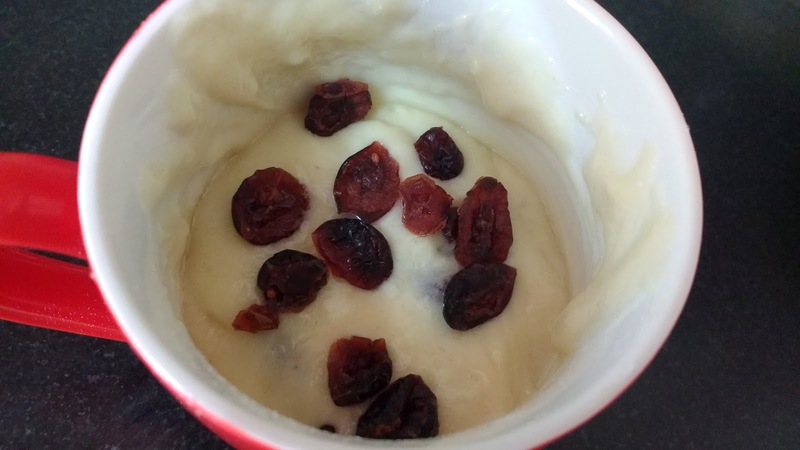 For the midnight hunger pangs, this recipe can be your perfect companion especially when you are bored of your usual instant noodles and want to have something quick, sweet and hot. I have used vanilla essence and dried cranberries for flavouring my mug cake. You can use any fresh berries as well. Also, you can add a tablespoon of mixed fruit or any other flavour of jam to increase the gooeyness of cake. 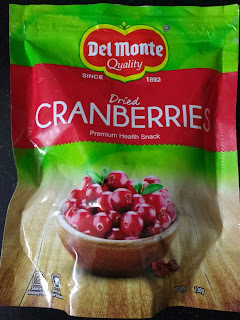 You can easily get dried cranberries or blueberries packs in the market. I have used Del Monte Dried cranberries for my mug cake (image below). These are otherwise good in taste also and can be eaten as snack alone. You can even add nuts or raisins if you don't have fresh or dried fruits. This recipe is the first cake recipe I had learned from my mother. I used to love eating cakes so much that I wanted them every second day as a kid. This recipe came as a rescue (at least for my mom ;) ). I still make it whenever I crave for cake and not in a mood to bake a proper cake. With just minutes of whipping; you will get fresh, soft and yummy cake ready. The cake is meant to be served hot. For additional sweetness, you can pour some sugar syrup or even chocolate sauce. Hope you all would like it!! *Oil used should be odourless. 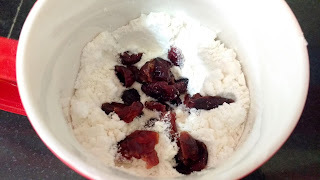 Add Maida, powdered sugar, baking soda and half of the dried cranberry in a mug/cup. Mix well. Add wet ingredients i.e. 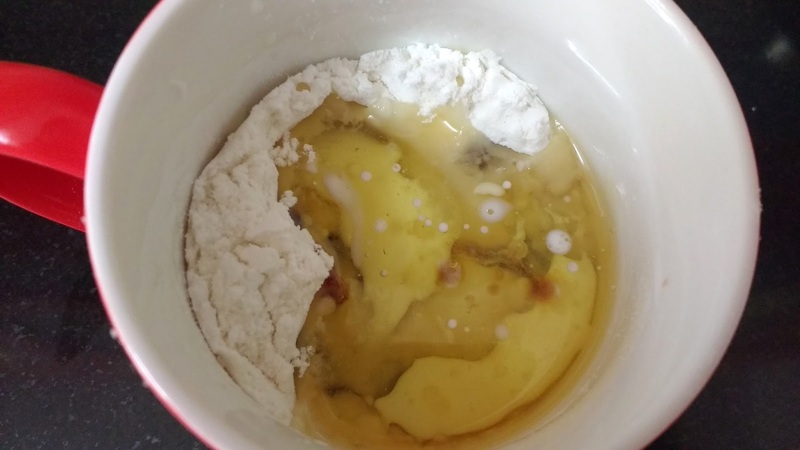 milk, oil, vanilla essence and vinegar to the mug. Mix thoroughly so that all ingredients are mixed properly. Make sure you stir till the bottom of the cup. Top it up with remaining cranberries. Microwave it until puffed or for (1min 45 seconds) - 2 min. The time taken depends on the capacity and brand of your oven. Mine gets ready in 1min 45 seconds. Insert a toothpick and check if it comes out clean. If it is wet, microwave it for another 10-15 seconds.